It's Friday, Friday. Did anyone else jam out to that song in high school or college? I remember distinctly when that came out, and every party that I would go to on a Friday would inevitably play that song. It may be annoying but it sure is catchy! I apologize now if you're getting that song stuck in your head! I'll start off today with my songs of the week to fix that, then talk about favorites! I hope you all have a great weekend! Love Tori Kelly's voice, and this one is probably going to be my summer anthem. I didn't want to love this song, but I can't help it! So catchy! Obsessed with this band. I've been hearing a lot about them lately and I'm jumping on the bandwagon! I had to include this song, because all I've been doing lately is running! This was an original performed on American Idol, and I'm in love. Hoping he goes through! February is a big birthday month in my family! Today is my mom's birthday, and in a few weeks it's my sister's. I'm pretty happy that I'm done with the Whole30, because we're going to be going out to dinner at some of my favorite restaurants! Tonight it's Rivertowne Tavern which brews some delicious local beers, and next week it's Hofbrauhaus, which makes my FAVORITE food and beer of all time! Since I'm on a no-buy, I've been "shopping my stash" and using up some products that have been neglected for a while! Here are some of my recent favorites, and what I've been wearing every day for a simple, 5 minute makeup look. Make Up For Ever Full Cover Concealer - blended under eyes and over any redness. Thanks to Whole30 I haven't had any breakouts, so I don't need to use foundation anymore! Rimmel Airy Fairy Lipstick - swiped across lips for a "my lips but better" look that's hydrating and long-lasting. I've mentioned it before, but Tim Horton's is my absolute favorite coffee of all time. Unfortunately, we don't have any shops in Pittsburgh and the only time I can get it is when we visit Dan's grandparents up in Bradford! Last weekend, I went there every single day for my Timmy Ho fix, and picked up their ground coffee to make when I get home! I've tried the K-cups before and they didn't taste as good, but the ground coffee in my French press is amazing. I found it on Amazon if you're interested in trying it out! The Steelers may be out, but I'm still excited for the Superbowl! I love watching football, and Coldplay should be a great half time show. Of course, I'm also pumped about the ads that will run during the game! Snickers just released theirs and it's hilarious. I hope this brightens your Friday a bit..it made me crack up! I have to admit that Snickers are one of my least favorite candy bars, but I always love their creative commercials! A few weeks ago, I upgraded my regular water bottle to my first Camelback, and I'm obsessed. Is it weird to be in love with a water bottle? I love how this one has a wide mouth, holds a lot of water (I got the 750 ml) but isn't clunky. I also really like the mouthpiece design- just flip, bite, and sip. There's no annoying sound when you drink out of this, and the mouthpiece is easily replaceable (I got a pack of these multi colored covers!) If you're looking to upgrade your water game, check this one out! I am honestly shocked and pleasantly surprised at the turn out for the first What's New With You? link-up! I was seriously nervous that it would just be Kristen and me linked up and I would feel like the girl at a high school dance that no one picked for the slow songs. Thank you all so, so much for joining in, and making me feel more like the prom queen! It was great to visit so many new blogs and meet some different bloggers. (I'm working my way through the list and trying to visit everyone, so I apologize if I haven't stopped by to say hi yet!) I got some podcast and TV show recommendations, makeup reviews, life updates, monthly goals, and more. The variety was fantastic and so much fun, so I'm really glad that you all like the theme of this link-up. Thank you all again for joining up and exceeding my wildest expectations! The next one will be on March 3, so mark your calendars! Who else jammed out to Friday back in the day? Whoops, now it's stuck in my head again! Sounds like you have some nice weekend plans. No big plans this weekend other than to pack for our upcoming trip/cruise oh and a Super Bowl party! I hope you had a lot of fun with your gf! Sounds like a blast! Love Rivertowne- enjoy the bday celebrations :)m pumped for the superbowl- just still need to figure out what dessert to make... and Yes Camelbacks are the best- Contigo makes a great water bottle too! Love contigo as well. Hope you enjoyed the superbowl! Happy Birthday Gretch's mom! I'm definitely excited for the Super Bowl commercials. I think there are going to be some gooood ones this year. Congrats on the smashing success of your first link up! I can't wait for next month! Thanks for the link to the Snickers ad! I saw the Hyundai Super Bowl on the news the other day. It has Ryan Reynolds and it's hilarious! Happy Birthday to your mom! I was so shocked and happy! The Ryan Reynolds commercial was hilarious..even Dan admitted that he's good looking! I got the Camelbak Eddy this weekend too!! It was on sale for $12 @ REI. I got the 1000mL one :) I'm also kind of obsessed haha. And, my birthday is the 24th, happy birthday to your fam! Congrats on the link-up success. I had tons of fun & found a few new blogs I plan to follow, including Kristen! Always nice to find some new blogs. I just got a NEW Camelbak Eddy.I think this will make #4 for me. It's definitely my favorite waterbottle & so easy to drink from on the treadmill while I'm working out. I would love some minimalist podcast recommendations if you have them, you mentioned you do. I am definitely on the get rid o' my stuff train & I'll take any help I can get! I'm so glad you joined the linkup! I'll send you over some recommendations today! Happy birthday to your mom! 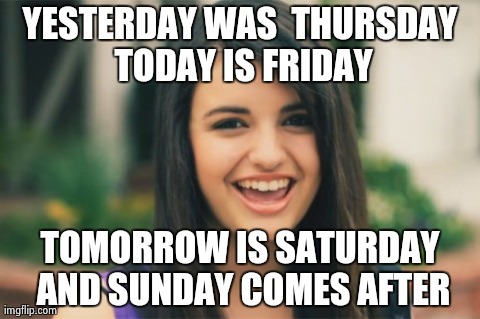 And yes, that song is now stuck in my head for the weekend. But if it makes you feel any better, its better than the other song that was stuck in my head for the past 3 days - the theme song fro a Disney Junior show. No thanks. I think it's a good thing I don't know that song ;) Sorry!! Your mom is lovely! Happy bday to her. I need a new mascara so might try that one out! So happy it's Friday and yay for the Super Bowl. Sad about the Steelers, but our nearby team the Panthers are in-- so we're cheering for them. To be honest you're not missing out on much with that song! love that mackenzie guy--that song was so good. i do want to give him a makeover though, lol. and yay for shopping the stash. kitten is one of myfave shadow shades ever. I agree! They need to do something with his hair! I used to love kitten! One of my favorite stila colors! Congrats on your successful link up!! I'm sorry I missed it. With a busy week I had no time to post again until last night :-(. Next time! And happy birthday to your mom! I had a Camelback Eddy for years! I too loved the bite and sip. I've since said goodbye *sniffle* and upgraded to a Klean Kanteen, but we'll always have the memories. 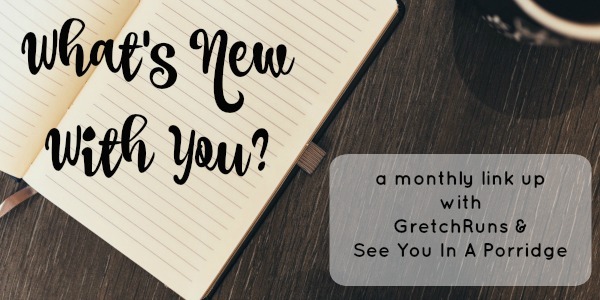 I hope you'll join next month! I'm so happy that you joined us Emily! Sounds like a great way to spend a birthday! Sorry you couldn't join them though. I loved the link up! You're a great host :) Haha it was cool getting to find other bloggers through it. Okay I'm a weird water bottle addict and have about 7 of those Camelback bottles... I love them! Omg and "Friday".. we played that nonstop freshmen year of college and it's such a terrible yet wonderful song haha. Have a great weekend Gretchen! Thank you so much Amanda! I'm so glad that you joined us. I love that you have a water bottle collection..never can have enough! Ah yes, my favourite top five friday time! I could have done without the song stuck in my head though. I'll hold you accountable for that one. :/ Ha ha ha. I'm glad you love Tim Horton's coffee! That makes me feel close to you. Although, I don't like it, but it's Canadian, so yay. Maybe I'm just spoiled and take it for granted. Can't wait to check out all the tunes you recommended! Happy Friday Gretch! Whooops ;) I can't believe you don't like TH! It's the best!! I am a huge fan of Camelbaks because I hate to have to twist off the top of a water bottle to drink! Plus then you get water built up on the ledges (where the twisty thing lines up--no idea how to word this! haha) and it drips all over you. BUT the thing I don't like is that every Camelbak I've had will leak at least a little bit if it's not standing upright. So putting it in a gym bag with water already in it doesn't work very well! I am so excited for Super Bowl commercials! I know what you're talking about and that's the worst with bottles! Mine hasn't leaked yet thankfully..hopefully it never will! I had to look up when that music video came out, how did it come out 5 years ago??? And how I am that far away from college??? Haven't heard of any of those songs either...but I've been listening to Pandora and I dont' think it always plays the newest songs. I love camelbak! I use it all of the time that and Contigo. They're the best water bottles ever. I find they hold so much water and aren't heavy. 5 years ago..really? Wow, time flies. That's awesome to hear your link up was a huge success. I would be worried if I did one for those same reasons. My pandora station has honestly been all over the place lately. I feel as if I'm playing Russian Roulette sometimes! I was shocked that so many people joined in! Really made my night :) What stations do you listen to on Pandora? Oh my goodness, that song does SO get stuck in my head! So catchy! It was fun to rediscover old products that I just forgot about. Just make sure that it doesn't have a weird smell or texture! And happy birthday, mrs b! It's such a great water bottle. Thanks for the comment Anna ;) You're so funny!! Congrats on the link-up success! It was a fun one! :) I'm also obsessed with the new Zayn song. My husband thinks I'm crazy every time I put it on. Thank you! It's a great song!! It's so, so good! I wish we had them in Pittsburgh! 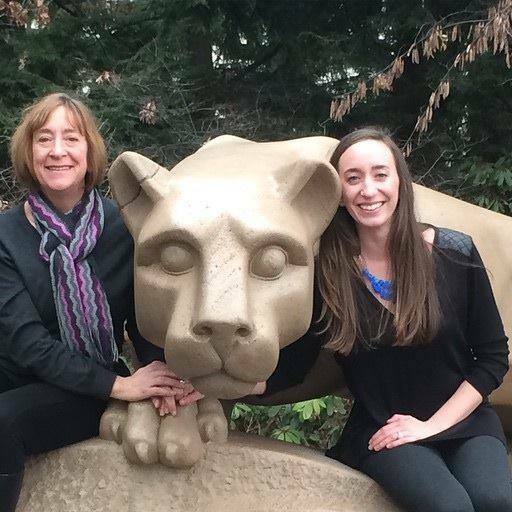 Ah, look at that picture of you with the Nittany Lion - such a great shot! I hope your mom had a great birthday! The weekend thus far has included a lot of shoveling snow, and then in more exciting news, my fiancee and I picked out our wedding bands! It was really great, thanks! That's so exciting about the bands..congratulations! Stila Kitten is one of my faves! I use it as a highlighter sometimes, too! I really want that water bottle. Ive heard good things! I was super tired last night and went to sleep during the 3rd quarter of the game. I loved the half time show but was otherwise underwhelmed with the Super Bowl. happy birthday to your mom! and yay for our link up success, i'm seriously still on a high about it. I tried to explain to KC and he was like 'yay' and i was like YOU DON'T GET IT. i don't hate snickers but i will eat them if they are in front of me haha and i love their commercials. i used to love my camelbaks but i had a few issues with them, and they didn't last very long. i don't mind replacing them though, so no biggie. i love not having to tip the water bottle up or have it run down the side of my mouth because i'm too uncoordinated to drink water from a large opening lol. i just bought a new one, i don't think it's a camelbak but it's the similar design except the mouth thingy locks in place so no leaking. yay. Hahah same for Dan! He was like whatt is a linkup. Such a N00b. I hope the waterbottle lasts..it would be annoying if it started to leak or something! I love Makeup Forever products! This past weekend was big for me - bridal shower Saturday and then super bowl potluck Sunday. Whew!